At Mobility at Sea, we pride ourselves on delivering a warm and friendly service to each of our customers. 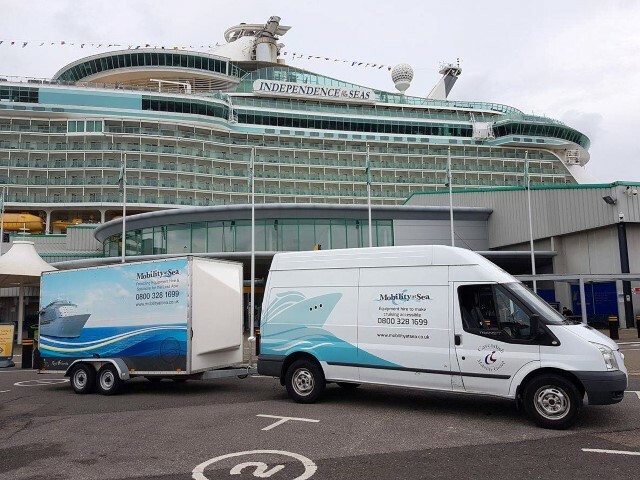 A big part of the business is to offer mobility products for people who are going on a cruise from Southampton, London Cruise Terminal, and Dover. To continually improve the service we provide, customer questionnaires are sent to all everyone who hires our equipment. We value honest feedback and listen to what our customers have to say. A big section of the questionnaire is for customers to leave comments. It really does make our day worthwhile to hear that you’ve had a fantastic cruise or really enjoyed using our equipment. "We hired a scooter and commode for a 12-day cruise. The scooter meant my wife could cover everywhere on the ship and ashore with no fear of falling or tiring herself out. For the first time, we really enjoyed our cruise. We would certainly recommend Mobility at Sea to anyone without hesitation and will use your services for our next cruise in 2020." "I was pleased with your service. The bed lever was identical to the one I have at home. It was very useful onboard, especially when there was movement in the ship. It made dressing and getting in and out of bed much easier. Thank you." "The mobile hoist was invaluable on the cruise and was invaluable on the cruise. All in all, it was a positive experience from start to finish. Will be using Mobility at Sea again"
"It was the first time we had used Mobility at Sea, and we were really happy with everything. It gave me a lot of freedom. Thank you very much." "Excellent service - ready and waiting when we arrived at the terminal. Smooth, seamless service. Very happy, will use again." "Excellent service by Mobility at Sea. The wheelchair was in my cabin as promised and I would not have been able to enjoy my cruise without it. Thank you very much." "The mobile hoist was invaluable on the cruise & it was a very positive experience from start to finish. We will definitely use Mobility at Sea again." "I have been reluctant to go on holiday because of the aids I need to use. My experience of using Mobility at Sea has changed that. First class service throughout meant I had a stress free holiday. Equipment was of a great standard & quality, placed in the cabin exactly as requested. Can not fault the service and am already looking forward to my next cruise! A big thank you to all your team." "I am so confident with Mobility at Sea that I have reserved equipment for next year. Having a scooter meant I could enjoy getting out and about both on the ship and ashore." "We have used Mobility at Sea for the last 3 years. The service that they provide is excellent and understand the needs of individual clients. We have always been treated with kindness and understanding of our needs. All equipment is first-class, delivered to the cabin, clean and serviced. We would highly recommend Mobility at Sea as we will always use them." "Excellent service. We would not be able to go on a cruise holiday without the equipment hired from Mobility at Sea." "I was delighted with the equipment which made my cruise possible and a real pleasure"
"Thanks for the equipment - very discrete and transformed my cruise experience! Very professional service & great value for money." "Many thanks for the upgrade of the commode. My carer said the hoist itself was better to use, therefore making my cruise more enjoyable, as without a hoist my holidays would not be possible. Unfortunately, due to cutbacks, my cruising days are over unless I marry a rich man (I think I will have more chance of winning the lottery). I have and always will recommend youto people because everything is stress-free. Once again, a huge thank you for making my holidays possible." 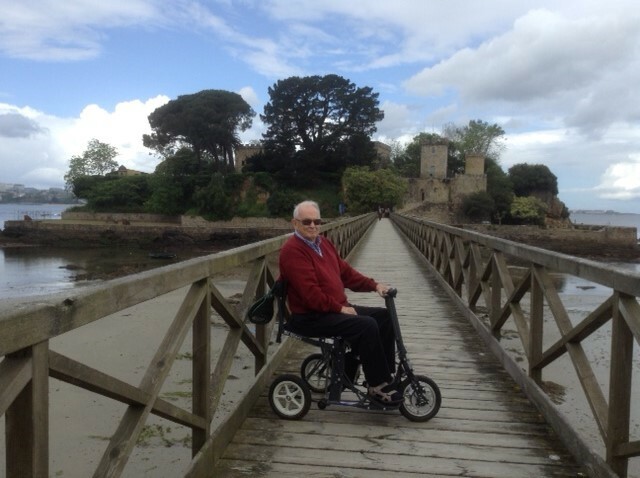 "I originally booked the use of a wheelchair as my sister was rather unsteady when walking & I thought if the sea was too choppy she might have problems walking. However, 1 week before sailing she had an accident, making it impossible for her to put on one shoe & extremely painful to walk. Having the chair was such a relief & she was able to enjoy all aspects of the cruise. Thank you, excellent service." "Excellent service. Will definitely be using you again for my next cruise in August, and will definitely recommend Mobility at Sea." "We have always received an excellent service from you. The hoist is ready and waiting when we get to our cabin and ready to go. At the moment, we are using your services 3 times a year." "Always goods ordered were the goods we got. Always satisfied with arrangements we have agreed. Have used your company a number of times now, usually on P&O and Cunard"
"Being a seasoned traveller, the one thing I expect is top quality service - I'm glad to report I got it with this company. I'll be honest, I was a bit nervous as it was the first time on MSC and the first time needing a scooter delivered to my cabin. Just as I was told - it was waiting, fully charged, when I boarded. Thank you so much. I would highly recommend"
"Mobility at Sea provides a great service. 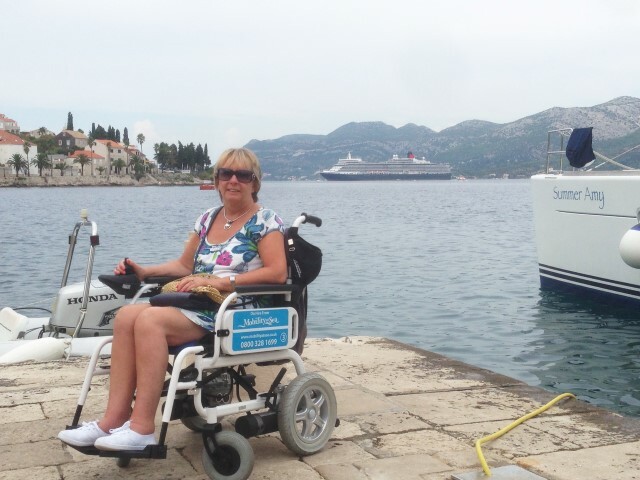 The wheelchair for my mother made cruise life much easier." "The wheelchair was in our cabin as agreed. Although we only used it 3 times the reassurance of having it available gave us great confidence that we would be able to enjoy the cruise without any problems." "Thank you for your excellent service. The bed we hired made my husband's holiday experience so much better. Easy to use hoist as well." "The electric wheelchair gave me my independence which I loved. The chair was easy to use. It was good to be able to take the chair out of gear to be pushed like a manual for the one time I forgot to charge it. This also made it safer to get up and down the gangplanks. The front of the control arm folding back made it that I could get close to the table in the dining room." "We have used Mobility at Sea on several occasions and always been pleased with the process and quality of equipment provided. This last cruise gave us a lot of stress due to the cruise company not being up to speed, but Mobility at Sea did all they could to help us and in the end provided us with an excellent service." " Excellent service via telephone. All my queries were answered and received good advice. I would not hesitate to use the service again." "This was the 2nd time I have used Mobility at Sea. I have not had any problems, it is so easy, the scooter is put in your cabin and collected. It gives me more freedom and is a good talking point." "Nice and easy to move around the ships. We notice people really respect you in one of your chairs, I wouldn't be able to go on a cruise without your help in the chair. My daughter did all the research and paperwork, this was the third year of lending your chairs." "Very good, will certainly use in the future"
"Thanks to Val Wallace for helping us out with equipment hire for both the hotel and the ship recently. Also to Jordan who left a family barbecue to come and move a bed for us that was placed in the incorrect room of the hotel. Our holiday was a success thanks to you and your company. Highly recommended and we will be back in touch again another time. Definitely." "As this was the first time we'd ever been on a cruise we decided to book a seven day one with P&O to see if we'd enjoy it. We booked it through Disabled Cruising, who were very helpful and recommended Mobility at Sea for equipment hire. The Mobility at Sea website had all the equipment that I needed during the cruise, so I gave them a call and spoke to one of their advisors who was friendly, professional and talked me through everything I needed to know. Because they were extremely helpful we decided to place an order with Mobility at Sea. On the night before the cruise, we decided to stay the night in Southampton. During our conversation Mobility at Sea said they could supply the equipment for the hotel. As this was my first time using this service, I was concerned that the equipment may not be set up in the room but when I got there it was all ready to use and as promised, they also set up the equipment we needed in our cabin on the cruise ship. I was very concerned that things would not run smoothly but due to Mobility at Sea's professionalism and organisation I had nothing to worry about. I was able to call with a question at any time and always get the right information back. I would recommend Mobility at Sea to anyone with a disability looking to have a lovely holiday. This cruise experience wouldn't have been possible without Mobility at Sea, so we've now booked another cruise on the Britannia in 2018 and have hired our equipment once again. I'd just like to say thank you for making our holiday possible." "I have just completed the questionnaire re my holiday and booking of equipment from yourselves and thought I would just email to say thank you so much for all your assistance. First time I had used your company and there is always that bit of apprehension but I needn't have worried as you made everything go so smoothly. As promised I arrived at my cabin and everything was in place. Also, all the staff I dealt with either by phone or email were always professional, full of knowledge yet remaining friendly. I felt at ease as if I had known them for years. So glad P&O recommended you. Thank you so much for helping me enjoy a stress-free cruise. Will definitely be back as Arnie says." "The whole booking procedure, equipment and service were excellent! Couldn't fault anything about you. Have already recommended you to other disabled cruising friends, and also on board ship. Well done Mobility at Sea. Wish all other companies were so efficient, helpful and friendly as you. Thank you." I would not hesitate to recommend this company to anyone who might be thinking of hiring a mobility aid. "I was pleasantly surprised and absolutely pleased when I arrived in my cabin on my latest cruise. There, already fully charged and ready to go was the mobility scooter I had hired from Mobility at Sea. They did exactly what they had promised, deliver the scooter to my cabin. I am very tall and weigh 16 stones. This scooter was midsize and had ample power to do most of the short journeys when I went ashore. In a nutshell, it made my holiday. I can walk but I'm afraid not very far. I saw more of this big cruise ship than I would have done had I not had the use of the scooter. I would not hesitate to recommend this company to anyone who might be thinking of hiring a mobility aid. If anybody wishes to contact me on this matter, you are welcome." "Many thanks for such a brilliant service. Equipment was superb. A million thanks, we enjoyed the cruise very much." "I would like to thank Alison and her team for their care and support during my bookings with Mobility at Sea, which have helped to make my holidays more comfortable and enjoyable. I have been very impressed with their service and would happily recommend them to others." "I find the service you give is just perfect for me. This is the third time I've hired a scooter from you. I wouldn't hire from anybody else." "I cannot suggest anything to improve the service because it is already excellent. Your staff at Southampton are so friendly, well informed, very professional. I wouldn't hesitate to use the service again or recommend that anyone else use it. Thank you for your help in everything." "Just a short email to thank you for the recent service provided by you for our cruise on Independence of seas, which finished yesterday. The equipment was delivered to our stateroom and worked perfectly, thank you! We have arranged another cruise for next year and will be in touch soon. Kindest regards." "Hello Carole, this is just to advise you that the dispatch and receipt of the scooter went perfectly, this being received around one pm on Wednesday 6th April. I am very pleased with this scooter and in my opinion, it is the best folding one I have come across. I have two other folding scooters, so am able to make a comparison. Thanks for your excellent attention." "Thanks again for your excellent service." "Marvellous. Once again many thanks for your kindness." "We found the staff at Mobility At Sea very courteous and efficient and the Mobie Motor Scooter they recommended brought the joy back to cruising for my mother. It was easy to collapse and easy to handle around the ship. Marvellous. Once again many thanks for your kindness." "Thank you very much. Our cruise has been so much easier and enjoyable after hiring this wheelchair. We will be doing this again." "Thanks for all your help with the rental of your electric wheelchair. This made so much difference to me and my wife while visiting all the ports, although Portugal has a way to go compared to the Spanish ports for the people in wheelchairs. I was amazed at the people on the cruise who were asking about your company especially the type of chair I rented. Once again I would not hesitate using your company again." "Val and Marcus, Many thanks for your help and encouragement. At no stage has the scooter let me down. It was much admired on QM2!" "We recently returned from a P&O Cruise on Britannia and I used one of your scooters. The service that I received when booking the scooter and when collecting it at Southampton was just brilliant and I wanted to thank you all. A very pleasant gentleman showed me how the scooter worked and folded down, another gentleman then delivered the scooter to our cabin (as I had to help my wheelchair-using husband). I cannot tell you what a difference it made to our shore outings. It was great and well worth the hire charge. I then just left the scooter in our cabin for collection. Amazing! Thank you all and, as I am cruising again next September, I shall be in touch to repeat the experience." "Hello to everybody at Mobility at Sea, I would like to say a massive thank you all for your help in hiring a mobility scooter for my recent cruise on board P&O Oriana, as chosen by me the scooter was already in my stateroom when we got on board, it was fully charged and gleaming clean and ready to go, on our return to Southampton all I had to do was leave it fully charged and you picked it up from my stateroom, it could not have been easier and your company could not have been more helpful with advice, I would not hesitate in highly recommending Mobility at Sea to anybody with mobility problems going on a cruise." "Your services were faultless and I have already passed on your details to some fellow disabled passengers on Anthem of the Seas. Thank you." "In June 2015, this scooter: 1) cruised down the Grand Canal in Venice to St. Marks Square; 2) Toured the medieval walled city of Kotor in Montenegro; 3) Graced the squares and streets of Corfu; 4) Not only visited the Colosseum in Rome but actually went inside the Colosseum; 5) Visited the Grand Casino in Monte Carlo, and 6) Completed its Mediterranean journey in Genoa." 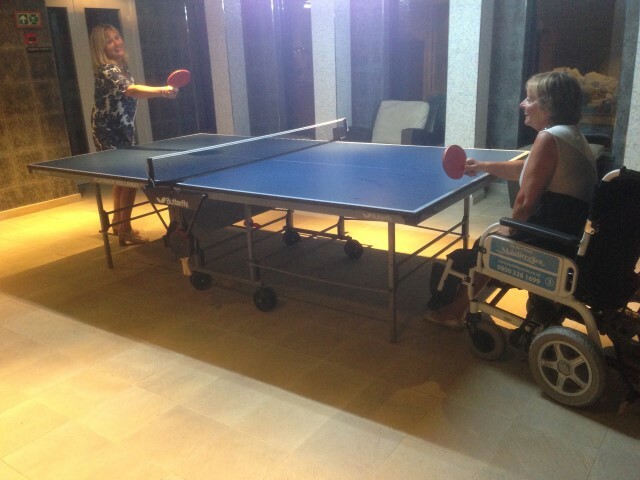 "So pleased - having the wheelchair waiting for them in the cabin made all the difference to their holiday." "...this scooter really made the holiday for me." "I wanted to thank you for your excellent service, the scooter was immaculate, in our stateroom when we arrived and collected before we left. As someone who finds walking any distance very difficult, this scooter really made the holiday for me. I look forward to dealing with you again in the future." "We would like to put on record the excellent service we have received from your company. We requested a rota stand this year which was first class from the one we had previously. The commode and bed elevator was all ready for us when we arrived in the cabin. Full marks to you all." "This scooter was requested as a back up as following recent surgery I was unsure as to my physical condition. I am pleased to say that I was able to walk with the aid of my walker and did not find it necessary to use the scooter at all. It was there for emergencies only, but it was reassuring that it was available if required." "Dear Dave, I enclose resumé of my recent cruise; the highlights indicate the remarkable workload for the [Di Blasi] scooter, which made my trip such as success." "With many thanks, we were very pleased with the wheelchair and have left the chair out where we picked it up from. Thanking you again." "We could not have managed without the wheelchair..."
"A note to say how very pleased we were with the service provided to us in supplying a wheelchair to us on board the Ruby Princess! Particularly the service we received from Alison Smith and a very nice young man called 'Chris'. We could not have managed without the wheelchair - so again very many thanks for being so wonderfully helpful. Yours sincerely." "Thank you for all your services. We found you to be so prompt and helpful. It really saved our holiday and made it a very pleasant one. All the best." "Brilliant service. I have used it many times. Maybe use some smaller hoists." "I would like to thank you and your company for the great service and the quality of the wheelchair you supplied for our holiday. If we cruise again next year, we will diffidently be using your service again. Regards from a very happy customer." "Very efficient service. A relief to know it is possible to take a cruise despite changes in our circumstances - thank you." "Now that's what I call service." "Just a short note to express my sincere thanks for all the arrangements made in providing me with a wheelchair and bath-board delivered right to my Cabin on the good ship Oriana, last April 20th. I am pleased to say it allowed me total mobility around the ship, despite the limitations caused me by "a stroke" and I managed pretty well. After a two-week cruise, I was able to leave the items in my Cabin for your collection and go on my way. Now that's what I call service. Thank you most kindly." "Thank you for helping my mum get the most out of her holiday." "Can I just say that the man who met us in the terminal at Southampton with our rented scooter was brilliant? He was knowledgeable, helpful, not only could he not do enough for us but he was a genuinely nice chap. I rented the scooter for my mother but wasn't sure how she'd take to it. By the time he left she felt at ease with the controls and confident in manoeuvring it. He could have just run us through the basics and left, but he did so much more. Thank you for helping my mum get the most out of her holiday." "I've recently returned from a cruise to Norway. Rent-a-Scoota was recommended by P&O Ferries. My cabin was kitted out when I arrived (With better equipment than I have at home!) and the powerchair they'd provided met my needs perfectly. It was easy to operate (They gave me an driving lesson first) and felt very stable at all times. I was able to go all over the ship unsupervised which was lovely (My husband usually pushes me around in a wheelchair). Not only was I able to get more of our cruise but so was my husband. We're both so grateful and are already looking at our next cruise." "Everything went smoothly, well organised, good value and a professional service." "I'd like to thank all of the staff behind the scenes at Mobility at Sea for making my cruise as comfortable as possible. I have been going on cruise holidays with my wife for years but cannot take my own scooter as it is far too big. Until now I'd never really realised how much I was missing out on - being unable to reach certain areas of the cruise liner. On previous trips, my wife has spent all of her time with me whereas now she can do her own thing without worrying about leaving me stranded somewhere. I soon got used to the mobility scooter and it might as well have been designed for cruise liners - it was perfect! Small and manoeuvrable but with a long enough battery life it was a Godsend." "...brilliant in keeping my freedom / independence going around the ship." "I would like to thank all those concerned in your debt for sorting me out with a suitable electric wheelchair for my above-mentioned cruise. So unfortunate the original wheelchair I asked for was no longer available on the day, but I am very grateful to you for sorting out a replacement – the Puma. It turned out to be so important, brilliant in keeping my freedom/independence going around the ship. Although I am not used to rear-wheel steering, I soon got the hang of it, and what I found most surprising was the elevation to height of the seat this most useful while positioning the electric wheelchair in order to take good photos, I could get high enough to take photos over railings and at shoulder height. Also most useful when viewing onboard shows in the theatre, I could see above everyone else !!! Thanks also must go to Mark, who met me with the wheelchair at the Southampton terminal explaining clearly how to use it, adjusting footrests to my level. He was very helpful indeed. Much appreciated Mark – you did a really good job. I have to say the Puma wheelchair enhanced my holiday. It would not have been the same without it; the battery range took me all over the ship without any problem. Because of this, I made friends with lots passengers. Just one minor difficulty of which you are already aware of with the Puma, it has a very low battery box casing near the ground. This can sometimes get stuck especially when getting on/off some gangplanks to and from the ship. Four strong men helped me in this situation. Thanking you for your help." "Dear Alison, many thanks to you and your staff, "Mobility at Sea" for the kindly and efficient service offered in organising and delivering a scooter to the ship. My Mediterranean cruise was a joy and not the ordeal I experienced prior to having the scooter on board, and I may add I had a lot of fun with it. The price was very reasonable, less than the other companies we tried! Best wishes to you all. "I'll be back!" "Thank you very much, everything was super!" "Thank you very much, I was pleased to see when I arrived at my cabin everything was set up for me already and all the equipment worked beautifully! I had a lovely holiday." "Many thanks for supplying the equipment required for our recent cruise. The reclining shower chair impressed my carers, as good as my own here at home, certainly, the best supplied whilst away from home! It was a pleasure to use an electric mobile hoist, almost as good as my own tracked ceiling hoist! The service provided by Mobility at Sea was exemplary, especially the last minute telephone confirmation. Once again many thanks." "Used you last year (mobility scooter rental), Excellent and Brilliant service cant wait for my upcoming cruise!" "The E-drive Wheelchair from Mobility at Sea provides the best of both worlds for a wheelchair user - combining the size and easy storage of a manual one, with the speed and independence of an electric one. Light and easy to fold and store, but also robust for use on shore. I am delighted that I decided to hire one. It really enhanced my enjoyment of the cruise. 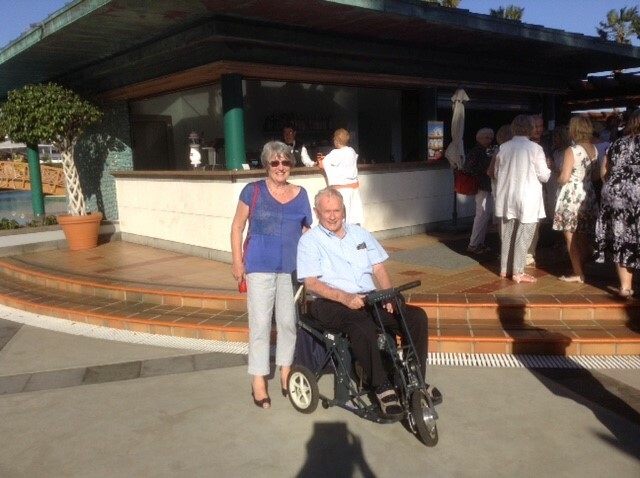 It was very liberating and I would highly recommend it to anyone facing mobility challenges on board ship." "Thank you very much. Everything was where it was supposed to be. Exemplary service." "...thank you so very much for an excellent service." 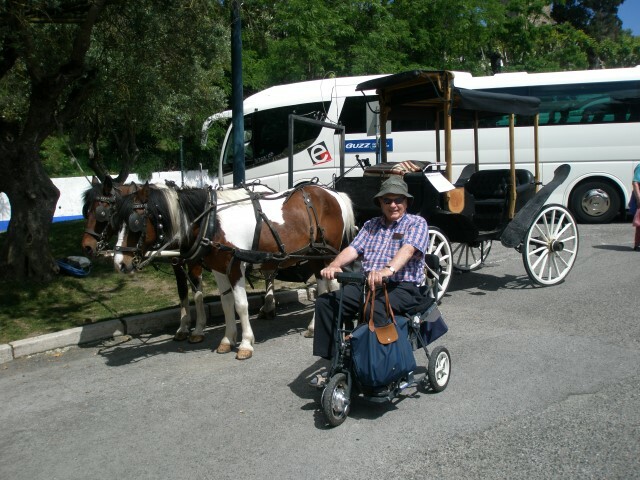 "Good afternoon, My wife Jane is profoundly disabled in a special wheelchair with multiple health problems and we are writing to thank everyone at P&O (and also Mobility at Sea and the Baggage Handling Company) for their kind attention to detail in making sure our recent cruise of the Eastern Mediterranean was a wonderful success. I would be grateful if you would forward this email to P&O management. Most importantly, I attach the Newsletter Jane started typing with her chin on the cruise (as her voice is now very weak and she has no movement in her hands or arms), using my laptop with a specialist program from Sensory Software called 'The Grid 2', which allows her to avoid becoming 'locked in' and instead to continue to speak and to write, albeit with great difficulty, in spite of her disabilities. Jane continued writing this patiently almost every day after we got home and I am so proud of her. She asked me to help her finish it off this week and to send it to you (which I am doing). I do hope you enjoy it. Happy new year! All the best." "Dear Sir/Madam, many thanks for the use of the scooter. It has proved to be invaluable. Yours sincerely,"
"...I have never enjoyed a cruise as good as this one, only because of your scooter." "My name is N.M. and I have just returned from the Constellation trip on a 12 day cruise to Spain, this is the first time I have ever used; a) your company or b) ever had a scooter on board a cruise. I have been on 30 or 40 cruises over the past 30/40 years, I have enjoyed most of them, but I have never enjoyed a cruise as good as this one, only because of your scooter. To be able to go backwards and forwards, whatever and whenever I wanted was unbelievable to me. I am 92 years old, but I am still active. I can't walk very far and your scooter did absolute wonders. Plus the fact that everyone was so cheery and so wonderful to me and asked where I got the scooter from. Thank you very much indeed!"